What’s with the “Holland” tagline? What is a “mini Holland”? How on earth are we spending £30 million on cycling? What does WFCC want mini-Holland to be, “on the ground”? Are there principles behind what the Waltham Forest Cycling Campaign wants? What happened with the Walthamstow “Village” trial – it was chaos! So why are people calling it a disaster or chaos? Closing roads in one area will just push the traffic to another area and the main roads will bung up. I don’t trust the council to spend the money wisely. Do you? Why should we spend so much money just to benefit a tiny group of middle aged men in Lycra? Ah, but cyclists break the rules! Cyclists just want more and more! I’m a parent and I hate mini-Holland! I’m a cyclist and I hate mini-Holland! What about people not able to cycle? 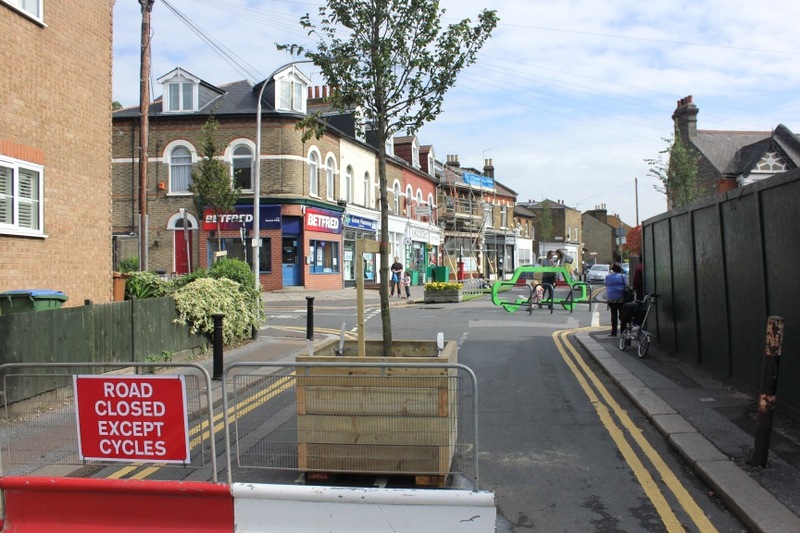 Does the Waltham Forest Cycling Campaign like everything in the mini-Holland bid? What about the main road schemes? What’s wrong with riding in the road? What about electric, driverless cars? Cyclists don’t pay “road tax” therefore they shouldn’t have a say about roads. Why do we need road closures? Just concentrate on main roads instead. You’ll never have lots of cyclists here – it’s too far to go to work, too hilly and too rainy. What about those people who can’t get on a bike? It’s all about cycling – what about other transport modes? You’re just doing it for yourselves. Waltham Forest Cycling Campaign is working closely with Waltham Forest council on the Mini Holland plans. The council is keen to hear from anyone with views on the scheme; you can email them at miniholland@walthamforest.gov.uk (or at cycling@walthamforest.gov.uk for other cycling matters). Alternatively you can email us at miniholland@wfcycling.org.uk with any feedback (and if you wish we will pass it on to the council anonymously). Every major city worldwide is grappling with congestion, pollution, collisions. And most of them are increasingly viewing the bicycle as a major part of any solution. Why? Because bicycle infrastructure is cheap and very good value for money. The DfT put spending on bicycle higher than any other form of transport in terms of repaying money spent in savings to the public purse (the NHS etc.). Because lots of people on bikes can fit in the space taken up by just a few cars. And because people on bikes are healthier, don’t cause emissions and are happier. Bikes, in short, work. And so bike infrastructure, that’s shown to boost numbers of people on bikes, works too. So, where should we look to for solutions to show what works in terms of getting more people on bikes? Places with loads of people on bikes might be a start. In the 1970s, Holland had a similar car culture to us. Now it doesn’t – because it made a choice to change. Now it’s not just Waltham Forest, and London, and Britain looking there, but the Germans, Americans, South Americans, Spanish etc. And we’re also, by the way, using tools developed from the Spanish and Germans also. In other words, if it’s demonstrated to work well, it may well end up in Waltham Forest. For more on how cycling will be if mini-Holland works, see this history of Dutch cycle campaigning, and these inspiring videos on Groningen and Utrecht. 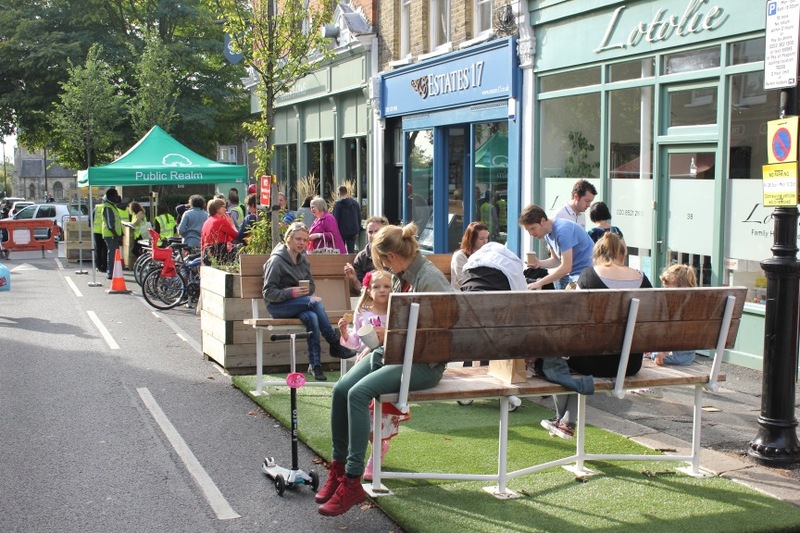 There is much more information about the Mini Holland programme and progress on Waltham Forest Council’s “Enjoy Waltham Forest” website, and on the “We Support Mini Holland” website set up by local residents. £30 million might seem like a lot – but even with the mini-Holland scheme and central London’s “Crossrail for bikes” N-S and E-W Superhighway plans, TfL is still set to spend less on cycling than cycling deserves by “modal share” compared to the amount it spends on general roads schemes for drivers etc. Holland, in comparison, spends vastly more on its cycling schemes per head (around £20). And, unsurprisingly, has far more people who cycle. Parliament’s transport committee recommended a spend of at least £10 per head on cycling across the UK. We’re currently at £1-2. All of the evidence from European towns & cities (and increasingly US, South American etc. ones too) is that providing space for cycling makes for better places to live, with widespread benefits for all, including: less pollution, healthier residents of all ages (click here to see what Barts NHS Heatth Trust has to say), savings to public health spending, better community links, thriving shops, less congestion, lower crime etc. Much of the £30m will benefit local people irrespective of their transport choice due to wide ranging public realm improvements such as better road surfaces, more effective traffic calming, more street trees and planters, and by delivering quieter, less congested, less polluted residential streets. 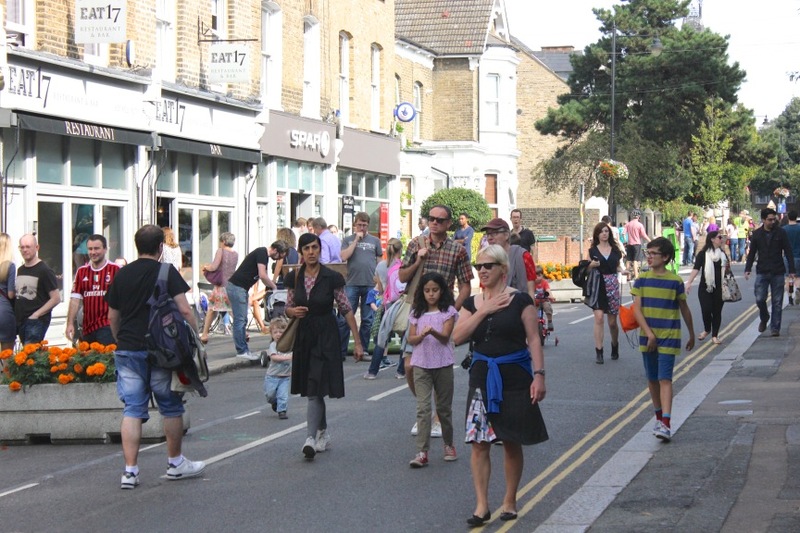 Those who walk (remember that virtually everyone in the borough does that) will benefit from safer streets, improved pavement surfaces and better crossing facilities. We think spending £30 million on a scheme to entice only a few more people to cycle would be disastrous. So the mini-Holland scheme must be designed to enable far more people to get on their bikes than the fit, confident 5 or so percent of largely middle-aged white men who currently do ride lots in Walthamstow. That means all-ages, all-abilities cycling – 8-80, male and female, with people from all backgrounds feeling able to ride around on bikes and including disabled people. That’s like many European countries, including in Holland. 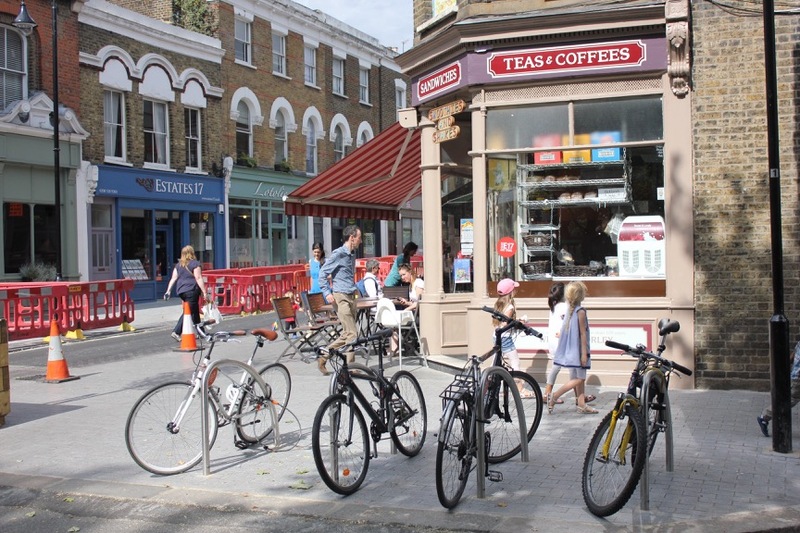 Lets people cycle safely from their front door to where they want to get to – central London, transport hubs, colleges & workplaces, and local shops , parks and leisure facilities. That means a mix of entirely “segregated”, physically separated bike lanes with protection extended across junctions for main roads; and quietened residential streets – ideally closed to through traffic and with physical measures to ensure speeds above 20mph are not possible. Changes driver behaviour throughout the area to be calmer, less aggressive and more aware of vulnerable road users. That means speed limits, ‘gateway’ treatments to signpost the area as being a more serene, slower environment and replacing on-street parking with more cycle stands and benches outside cafes etc. A very welcome byproduct of these measures creates “Living Streets” and community identities again – with drivers much clearer about how to behave appropriately in places where children play out etc. – and could well boost the local economy too with nicer shopping streets. We will be working with the council to ensure the mini-Holland implemented on the ground matches the bid document and succeeds in shifting a sizeable number of journeys from car to bicycle & on foot. We will also be holding the council to account to ensure only designs that deliver serious improvements go in. And that the schemes are effective not just for people who want to cycle, but also encourages more journeys on foot, and works well for local residents and local businesses. Cambridge Cycling Campaign have just produced a superb guide ‘Making Space for Cycling‘; we’d like to see this approach taken in Waltham Forest. Lea Bridge Road, with a radical redesign for the Whipps Cross Roundabout, fully segregated cycle lanes from borough boundary to borough boundary, and far safer, calmer junctions to at least the borough borders – and hopefully beyond. “Villagisation” of residential areas in central Walthamstow stretching from Lea Bridge Road to Forest Road and Wood Street to Blackhorse and Markhouse Roads. These will use road closures with bollards, planters, gates etc. to quieten enough streets to massively reduce through traffic across each area. Key safer routes north-south and east-west through Walthamstow to the rest of the borough to enable many more people to cycle around the area on calm, and more pleasant routes. Loads more cycle parking. That includes: residential “hangars” that store bikes securely on-street (ideal for people in upstairs flats); more and better secure and stand parking at all our tube and rail station. And much more training for adults and children and families; cargo bike trials for businesses; and other measures to help everyone get involved. Yes. We have a set of guiding principles when approaching our engagement with the council and other bodies. Road space reallocation and segregation on main roads. We’ve looked at cities around the world that work for cycling, and for everyone, and learnt some basic lessons. People who cycle don’t like to share the road with buses, HGVs and cars. Nor do they like to share pavements with pedestrians (and vice versa). You can tell motorists to drive more nicely, or tell cyclists to learn to cycle better all you want. But to boost cycling numbers and have cities that work better for everyone, you need to physically segregate on any busy road between pavement, cycle way and road. And that infrastructure needs to be high quality – working across junctions, feeling safe and with enough capacity to cope with a mix of users. Yes, that does mean less space for cars – but it should also mean less congestion due to fewer non-essential trips being done in cars. It should, also, mean good news for local businesses. Time and time again it’s been demonstrated that boosting cycling in an area boosts business trade (* see below). On quieter roads, let people who walk and cycle through, but reduce motor traffic access and speed. Road closures, pedestrian/cycle areas and speed reduction on quiet, residential roads (especially when clustered to eliminate traffic just driving through an area without stopping) are cheap and brilliant ways to not only enable cyclists of all abilities to get around in a safe, calm environment, but also make where we live “Living Streets” where kids can play out, where neighbours can chat etc. This is why we believe the council should not be designing residential streets to encourage through traffic onto them. b) Most people who cycle are also drivers also (in fact, regular cyclists are more likely to own a car than the average). We know how nice it is to get around by car, how convenient. 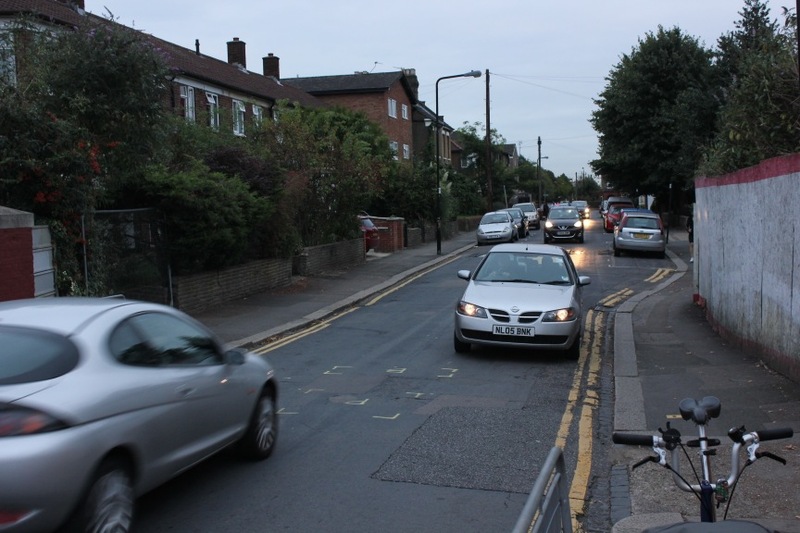 c) Around half of Walthamstow households do not have access to a car, yet suffer all the downsides that our current levels of car use are responsible for. And we’re not proposing anything that should make car drivers howl with fury. What we’re saying is many more people would like to ride bicycles than do – and we need to create the road designs that let them, because it’s good for all of us to have fewer cars on the road and fitter, healthier, happier residents. There are lots of problems with current road designs for those who cycle & walk. One-way streets result in faster, more aggressive traffic; roundabouts and gyratory systems are intimidating and dangerous; high speed traffic and busy roads also; speed cushions often fail to decrease driver speeds and can put cyclists into conflict with motorists; painted cycle lanes are ignored and don’t feel safe; parking is often aligned or placed to leave a significant risk of a “dooring” collision; pavement parking eats into pedestrian space and again provides dooring risks etc. There are any number of people who think they have the right answer for cycling and the area. And we think it vital residents have a say in schemes done in their areas. But it’s also vital that we use tried-and-tested, best practice methods for improving cycling taken from other cities and from other areas of London. We’re using the expertise of the London Cycling Campaign’s “Junction Review Group” and others in the organisation, as well as using real-world examples of what works from other cities and locations, to push for schemes that are the best quality they can be for everyone. The predicted traffic-apocalypse has not happened. Yes, some main roads outside the village have been horrific for drivers at times. But they often are horrific anyway – before and after the trial. And all the information we’ve had from officers is there have been multiple reasons for those occasions that are nothing to do with the trial scheme: a closure of the Blackwall Tunnel, multiple lights on Hoe Street malfunctioning, burst water mains and more. In fact, as of time of writing, the closures that should most impact Church Hill are back in – and Church Hill is no better or worse than it was during or after the trial. Traffic inside the village did get worse on a few roads. The Waltham Forest Cycling Campaign predicted that the council’s scheme risked concentrating through traffic onto a few roads – and this did happen. Happily, council officers have largely ironed out issues arising from the scheme before full implementation. That, after all, was the point of a trial. During the trial, many businesses were very nervous about the effect of the closures on their footfall. Nearly all businesses now back the road closures, particularly since they were modified to allow loading/unloading times. A tiny few (along with a mall number of residents) hate the scheme still; but frankly, this seems to have little to do with legitimate concerns. Broadly speaking, few of the other predicted (and even claimed) woes have materialised. People can still reach their front door by car (except for a handful of flats and businesses in one very short block on Orford Road), and can park their car on their street, and deliveries can get through to where they need to. The wildly pro camp and the wildly anti camp are both made up of a fairly small number of committed people with strong views. Council officers surveyed thousands of people who live in the area affected, and the businesses based in it, to get an accurate picture of support for the scheme. The scheme will be rightly based on their wishes and what works for them – not who shouts loudest on Facebook or Twitter. Several reasons. For starters, the council’s approach to pre-trial consultation was very poor. Letters and maps were incomprehensible, a public meeting was only held two weeks before the trial started and descended into a shouting match etc. It’s worth noting, since that debacle, the council placed officers in the centre of the trial area every day. Partly because of the pre-trial communication mess, it’s been a huge shock to many people. Instead of putting in one or two road closures here and there in an incremental fashion, as has already been done in lots of other areas of Waltham Forest, in Hackney, and elsewhere, this was several closures across a small area in one go. It caused confusion among motorists and residents mainly as it wasn’t communicated effectively. We believe this shock is also one of the reasons why people are claiming delays on main roads are down to the trial – and not just the normal traffic issues we face in a massively over-congested area. There are of course, a few people who really dislike the idea of the scheme and the trial. And they’re really, really vocal about it – in the village itself and online. That doesn’t make them a majority – or even a sizeable minority. Again, it’s down to local residents to make this scheme the best it can be with the council We’re here to help make the scheme the best it can be for people who want to cycle and walk, to ensure it delivers real benefits and encourages more to make more sustainable transport choices. But ultimately we don’t believe in imposing a hated solution onto residents. We don’t think there’s much sign this is that, though. We’ll have to disagree on that one – as will, we suspect, most residents in the scheme areas. There have been numerous arguments from naysayers about the residential streets schemes and why they aren’t of value. Some suggest the schemes are all about gentrifying the village area further (ignoring the other Walthamstow areas set to benefit); some suggest what people who cycle really need is segregated space on main roads (ignoring the fact mini Holland also covers this); some suggest ratrunning was a beneficial thing or that it didn’t exist. All of the evidence is traffic driving through a residential without stopping not only adds little to a neighbourhood’s economy but also saves the people who drive through very little time overall. On the other hand, it stops kids playing out, means fewer older people venture out, makes it more dangerous to walk, cuts cycling rates through an area, adds huge amounts of traffic pollution and noise to residential streets and is horrible to live with. And with the village trial completed, we can now see that ratrunning clearly does exist – and what a problem it is. The term “ratrunning” is not meant to be anti-driving. Many of us (including most cyclists) drive a car. And if it’s very convenient to drive 2km to school, or to the tube, it’s hardly surprising lots of people do it. But we have to recognise enabling and encouraging that behaviour isn’t a good strategy for healthy communities. We need a lot more people to get out of cars for short and unnecessary journeys. And its worth remembering that in most of the Walthamstow area only 50% of households have access to a car, most of whom get no benefit from the availability of through routes for cars. The aim of the schemes isn’t to force people out of cars, it’s simply to slightly rebalance the convenience of car driving for some journeys with walking and cycling. The result we hope is more people who don’t really need to drive getting out and about on foot or by bike, leaving more space on roads for those who genuinely need to drive (because they’re carrying heavy loads or they’re disabled, or whatever reason). Are they? If so, why are people not cycling on them? Every one of the residential areas set for “villagisation” features a high proportion of through traffic. In the village scheme we know already on some streets 80 percent of traffic was cutting through the area without stopping. We’ve all seen drivers cutting corners at speed, or flooring it to get to a gap between parked cars (and its rarely local people doing this in their own neighbourhood). This kind of behaviour is terrifying when you’re a parent with a kid on a bike seat, or a less confident person on a bike, or simply walking along on the pavement. And if you’re inexperienced in riding a bike, you only need to encounter one or two aggressive drivers (out of dozens of more considerate ones) gunning their engine behind you, passing too close, or travelling too fast for the road conditions, to put most people off cycling for life. As the WFCC we’re very open to solutions that quiet residential streets other than just road closures – but we all know speed humps and traffic cameras really haven’t worked well enough on calming traffic. There are too many closures. The village trial of road closures was ample demonstration of what happens if you only close some roads in a residential area. It’s fairly obvious – the ratrun/through traffic simply funnels onto the remaining open roads. Which get far busier and worse. In other words, you’re not eliminating through traffic, you’re concentrating it. That’s hardly fair – and it doesn’t lead to the kind of calm space we need to encourage cycling. Many people who say this seem to be really saying “I want some closures that don’t really affect my drive, but I don’t want closures that do affect my current driving patterns.” And really, how selfish is that? What we’re seeing so far is that when you successfully close through routes in one residential area or “cell”, the through traffic in nearby cells also drops. In other words, many ratrunners pass through multiple cells in one go – only briefly using main roads. When you close off a cell, then some of that through traffic gives up trying to cut through altogether. On main roads, the simple answer is no they won’t. A well-established phenomena known as “traffic evaporation” (Google it – there’s loads of studies of it), shows that closing roads can cause some increased congestion on nearby main roads for a few weeks, but then traffic invariably settles back to where it was before. In other words, drivers are only willing to sit in a queue for so long before they switch route. After a while, congestion goes back to being approximately as bad as it was before. Despite widespread claims of traffic apocalypse, for instance, Church Hill congestion has remained largely the same through the village trial, after the temporary closures were taken out, and when the permanent ones were put in. We expect to see a pattern of increased congestion for a few weeks, then settling back with each set of closures that go in. Yes, and no. Waltham Forest council doesn’t have an amazing track record of delivering the best infrastructure for people wanting to cycle, or for boosting cycling numbers effectively. That said, in recent years it has come further, faster than just about any other London borough, in our view. The Cycle Action Plan in 2012 marked a step-change in the way the council treated cyclists. The Plan included major pledges that have since been acted on strongly, such as 20mph default speed limit for the borough, work on the 20 most dangerous junctions for cyclists and ensuring all lorries used by the council and its contractors had the best in safety equipment and training. And it was backed by strong leadership and action from Councillor Clyde Loakes, the environment portfolio holder, as well as key officers (some of them new to the borough). Since that point, the Waltham Forest Cycling Campaign has been consulted on highways schemes earlier and with more genuine changes implemented than ever before. The mini-Holland bid represents the culmination of all of that work – with key Councillors and officers really pushing radical and controversial items into the bid, in the teeth of some resistance. So, the signs are good – but the devil, as they say, is in the detail. What remains to be seen is how well the council actually delivers such radical plans on the ground. But the Waltham Forest Cycling Campaign has been very very clear with officers and Councillors already – we intend to hold them very strongly to account. We view the bid document as an absolute new baseline for all highways work the council does going forward, with the expectation that every element of the bid should, if successful, be rolled out eventually across the borough. We will no longer accept lowest-common-denominator design that panders to motorist convenience over all-ability cycling and walking safety and public transport. We believe that if the council holds its nerve and delivers uncompromisingly high quality infrastructure for people who walk and cycle, we will see hugely positive changes other councils (with approaches based on very small infrastructure tweaks) can only dream of. We also will be very public if we feel the bid is being watered down in its transition from plan to reality. And the council knows it needs our support and feedback to make the bid a success – it has a lot on the line and it won’t be good for them if we end up telling TfL that the bid is being massively weakened. We also very much hope and believe that council officers and councillors recognise the fact that a watered-down bid will do no one any favours. The worst possible outcome would be a “mini Holland” reality that ends up spending £30 million to inconvenience drivers while not massively boosting cycling numbers – it’d be a lose-lose that would haunt the careers of everyone involved professionally, and a hugely wasted opportunity for our local communities. 2-3 per cent of people in the borough commute by bike regularly (and around 5-6 per cent in Walthamstow and the south of the borough). But the majority of residents own bikes, and say they’d like to use them more. Fear of dangerous drivers and aggressive roads is the single biggest barrier people say stopping them from cycling more. So if we get it right, the money actually means far more people will be able to cycle. That’s why the key elements of the bid are very specifically not about marginal safety gains for that current, confident 2-3 per cent of cyclists. The key elements of the bid are specifically about enabling anyone from 8 year old school kids to 80 year old grandparents to get around by bike, safely. While the amount of money set to be spent seems huge, it’s also important to put that in context. In many Walthamstow wards, car ownership per household is around 50 percent. So currently, we have a roads system designed to only benefit half of local residents, that has far more than £30 million spent on it per 3 year cycle (the amount of time the mini-Holland bid is theoretically meant to cover). The TfL budget for this year (2015-16) alone is £10.9 billion. The current budget for cycling across the whole of London, including the mini-Holland schemes, for the next ten years, is £913 million – less than 1 percent of all funding for more than one percent of journeys. In central London, cyclists now make up a quarter of traffic at peak times, 16 per cent across the day; in neighbouring Hackney, 14.6 percent of residents use bicycles as their main way to get to work. Finally, it’s also important to put the bid against its alternative – we just keep doing nothing for people who want to cycle while doing loads for those who drive. Over half of outer London car journeys are under 2km (over 80 per cent under 5km) – the status quo is a disaster for us all. The dominance of the car in London is why the city is facing potential pollution fines from the EU; it’s why, more importantly, so many of our children and old people have pollution-related health issues such as asthma; it’s why we face a looming obesity crisis that could cripple the NHS; it’s why we face such insane levels of congestion on our roads; and it’s a disaster for climate change etc. also. Pretty much every single extra person cycling means one less car on the roads – less congestion, less pollution, a fitter population etc. Which is why it’s vital mini-Holland succeeds – it’ll be good for everyone, including those who don’t cycle. Why do people who cycle break the rules and how? Let’s think about that for a moment. Because all road users break the rules. And there’s some evidence that motorists are worse rule-breakers in general – and loads of evidence they’re far more dangerous rule-breakers. So, some cyclists who ride on the pavement – it’s annoying, but it’s very rarely, statistically likely to result in anyone being injured. And why do people on bikes ride on the pavement? Largely because they’re terrified of riding in the road. Remove road danger issues and you’ll largely remove any valid reason for cycling on the pavement , as demonstrated in many European cities. In the same vein, cyclists who run red lights are annoying. But they’re rarely dangerous to anyone, even themselves. In fact, there’s good evidence that of the recent spate of cyclist deaths in London, a disproportionate amount are meek, mild pe0ple on bikes who are obeying the rules and are crushed by an HGV who can’t see them. It’s arguable that it’s better to be way ahead and visible at the lights than in an “advanced stop” box that’s small enough the lorry driver behind can barely see you. And some people on bicycles ride the wrong way down one way streets. Often this is because it’s safer to cycle up the one street the wrong way, than follow a circuitous one way flow round the block with additional turns at tricky junction to negotiate. And of course it is much shorter and quicker. And remember these one way streets were put in fairly recently for the convenience of motorists with little regard to the safety and convenience for those on foot or bicycle. So, some people on bicycles break the rules for their own safety. Or because they’re idiots in a hurry. Either way, they’re not statistically a danger. You are approximately 40 times more likely to be seriously injured or killed by a car on the pavement, than you are by a bicycle on the pavement, for instance. On the other hand, we have endemic red-light running and driving while texting among people who drive – who kill thousands of people in the UK a year through inattention or rule-breaking. Yet we don’t seem to have a problem giving the majority of roads money to this group. We should not collectively punish people who choose to ride a bike for the actions of a few, any more than we punish drivers for the actions of a few. Instead, we should be making good design decisions about our streets based on the good of everyone. And as we’ve already argued, we think that means making streets much safer for cyclists so that more people cycle (and fewer on the pavement). No, we just want all the people who would like to cycle to be able to cycle. The current cycling infrastructure blatantly doesn’t work for most people – “safe” routes that see you sent through unlit, isolated underpasses and cycle lanes that are ignored or hemmed in by fast-moving motor vehicles, if they’re there at all, will never entice more people to cycle. We simply want what many European cities already have – a better balance between car use and cycle use on our overcrowded city streets. We want safe, direct routes that let people ride around without being constantly in conflict with cars and HGVs etc. While 30 million might seem a lot to most of us to spend on cycling, it’s also important to retain some perspective. TfL are funding the scheme – so we can’t spend the money on social housing, or elderly care, whether we would like to or not. Cycling schemes in London currently also take up less than 1 percent of TfL’s budget. Yet cycling represents more than 1 percent of London journeys. We’d like as a bare minimum, a fair share. To really create a more sustainable, happier, nicer city, we need a lot more than that. But either way, 30 million is a drop in the ocean compared to, for instance, spending on motorists in London. Your child likely loves riding their bike around the local park. They love having the freedom to explore. Is what you want for them to get to their teenage years and you to feel too scared of the roads to not let them out on a bicycle? Would you like your children, when grown up, to spend as long sitting in traffic queues as we currently all do? The “leisure” cyclist. You like cycling through the forest or along the canal, perhaps with your kids. You think Walthamstow is great for cycling already. If that’s the case, why do you need to get your kids in a car to drive to the car park from where you ride? And why don’t you ride to work? Chances are your answer can be boiled down to “the roads are scary”. And how do we deal with that? Hmm… let’s think… mini-Holland! The “vehicular” cyclist. You ride to work, you ride into Essex, you already cycle lots – and likely fast. And you’d often rather use the road than bother with rubbish cycle paths. The stuff you see going in doesn’t make much sense to you. And is overkill for cyclists. Except, have you ever wondered why the overwhelming majority of cyclists you see are male, between 20 and 50, fit and fast? Because cycling in London is often so scary and requires such nerves of steel and lightning reflexes it puts off most other people. Mini-Holland will make your ride safer – with calmed junctions and high-quality tracks. But it’s really not just about you. 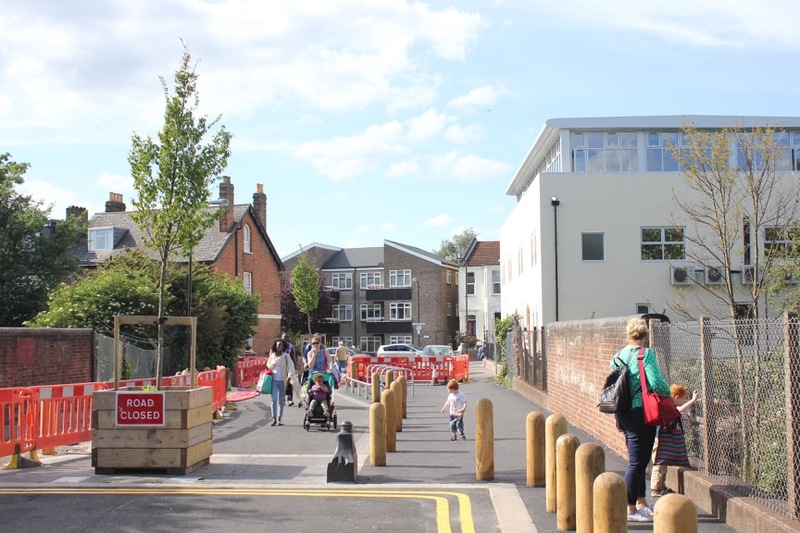 Mini-Holland is mainly aimed at unlocking the huge potential to get parents out of cars on school runs, to swap short-hop shopping trips onto bikes, to get all ages and all abilities riding bikes. And that “all abilities” is right. If we do it right, it means a safer, smoother ride for you – and loads of kids, women, grandparents etc. on bikes too. Some people can’t cycle – for a variety of reasons. The mini-Holland bid should reduce long-term congestion by removing drivers and cars from the roads as people take up cycling more. And anywhere you can currently get to by car, you’ll still be able to get to after mini-Holland has become a reality. We also would point out that while the vast majority of current cyclists are middle-aged, fit men, that’s simply not the case in European cities where cycling is more common. In places like Amsterdam you’ll see 80 year old grandparents cycling alongside their eight year old grandchild; women in suits and heels on bikes; all types. The point of the mini-Holland scheme is to unlock the potential for many more people, of all types, to get on bikes. And to transform Walthamstow’s residential streets to make them safer and more pleasant to walk in. What about the impact on people with disabilities? There are a wide range of disabilities and the proposals will affect different people with different disabilities in different ways. Some with impaired mobility will find it easier to get around their local area safely if there is less motor traffic to contend with. However people who are dependent on motor transport some may find that they are inconvenienced by road closures and concerns have been raised about speed humps. The speed humps are a requirement for the council’s 20 mph zone (which was implemented before mini-Holland) which the MET say must be ‘self policing’. As part of mini-Holland speed humps and cushions are being replaced with ‘sinusoidal’. These humps should be more comfortable than humps used previously in the borough, especially if driven over more slowly, and avoid the swerving often seen to straddle speed cushions. Where a speed hump is causing a problem the council should be contacted as it may have been installed incorrectly, or they may be able to make adjustments. The mini-Holland schemes were designed with people with disabilities in mind. Discouraging unnecessary car journeys (TfL estimates there are millions of these annually) should improve congestion and reduce delays for essential journeys. Longer term still, you may want to look at the experience of people with disabilities and their mobility in countries such as the Netherlands, where many cities have extensive networks of road closures. In these countries people of all abilities use the safe and convenient bike lanes which also afford safe and direct travel for people who need to use mobility scooters. If you would like to know more about inclusive cycling, check out the London based charity Wheels for Wellbeing. No, of course we don’t. No plan is perfect. And what seasoned cyclists like us might want isn’t always what the council thinks they can get most people to accept. There’s also still lots of detail missing from the final plan – exactly how some of the elements of the bid will translate to reality on the ground remains to be seen. And there are some elements which we think are “work in progress”. For instance, the plan for the Whipps Cross Roundabout in the bid document was overly complex and we didn’t feel it was the best possible solution for all; in the summer of 2015 the council consulted on a double T-junction for Whipps Cross and this design is at the leading edge of best practice, but may still need a few tweaks to ensure it works optimally for all road users. We also don’t think all elements of the initial trial worked as well as they should have – some roads were still left open to through traffic, which was funnelled onto them – the end result was most roads were much more quiet and some roads were way busier. We want to see the final schemes worked on by residents, businesses, cyclists and the officers and engineers at Waltham Forest council together – for the best possible solution for as many people as possible. Ruckholt Road is being built, short sections of Blackhorse Road, Hoe Street and Selbourne Road have arrived prior to mini-Holland because of school building projects etc. 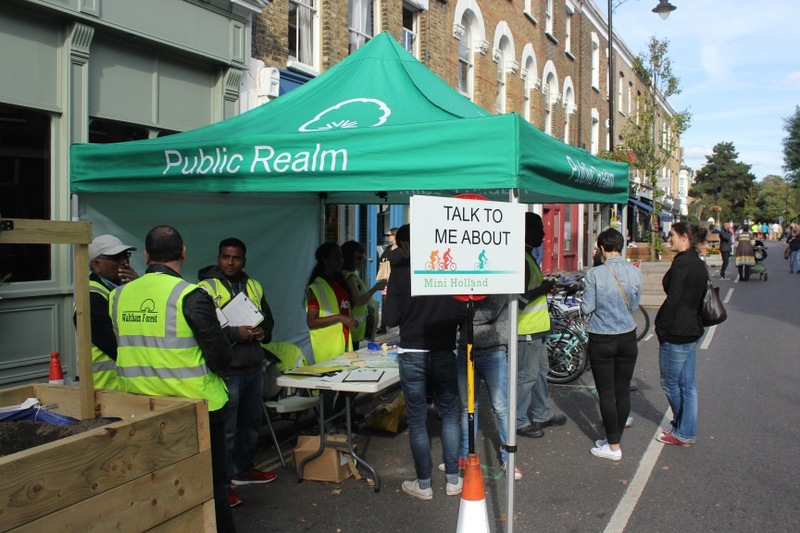 And public engagement on Lea Bridge Road, including businesses, has finished its first phase. Forest Road public engagement surveys are currently online on the council site. And more main road schemes are coming forward soon. Once upon a time there were cyclists who loved riding in the road. We’ll call them “vehicular cyclists”. They were fine mixing with traffic. They were fast. They are the huge majority of modern UK riders. They’re also a tiny minority when you go to places like Holland – where most riders aren’t fast and won’t mix with traffic. Simply put, all the evidence is that if you force people on bikes to mix with HGVs, buses and fast-moving cars – even if you ask all the drivers nicely to behave – most people don’t ride bikes. If you want more people on bikes – which is healthy, congestion-cutting and emissions cutting – you need good protected space not paint on the road. All cyclists should be compelled to take a test, wear a registration plate, wear a helmet and get insurance. All of the evidence is against you on that one for many, many reasons. Most importantly, there is ample evidence that putting barriers between people and getting on bikes simply suppresses demand for cycling. As cycling helps with health, congestion, pollution and more that seems very silly. Imagine if nearly every cyclist on the road suddenly got into a car, it’d be total gridlock. We want the opposite. Cyclists also pose no significant risk to others around them – they cause very few injuries to others (or even themselves), cause very little insurable damage etc. So while pavement cyclists, for instance, are very annoying, you’re over 40 times more likely to be seriously injured or killed by a car on the pavement than a bicycle. So the potential benefits from forcing people to jump through hoops to get on a bike are small, while the potential costs to society are huge. On top of that, the vast majority of cyclists on our roads have already taken a test (cyclists are more likely than the general population to be drivers), there is little evidence that helmet use decreases head injuries and some evidence it causes drivers to pass closer to those who wear helmets, and many cyclists already have good insurance (join the LCC, our parent organisation, and you’ll get it free with membership). And cyclists are already identifiable, while registration hasn’t helped with the huge number of local uninsured, unlicensed, unMOTed drivers on our streets. Will they solve our congestion issues? No. Road tax doesn’t exist – hasn’t since 1937. Motorists don’t pay for roads – we all do. But even if you personally paid for all roads, would you really want all cyclists off them? Because then they’ll all be in cars – causing more congestion. Or is what you’re really saying that you don’t want to spend to make cycling safer? Because, again, think about how callous that sounds. If we are just talking about the safety, or perception of safety, of current cyclists, then main roads are inarguably vital. Protected space on main roads is the most obvious and dramatic element of a Dutch-style approach to cycling. So why road closures in residential areas? Around 40 percent of outer London car journeys are less than 2km. 80 percent are less than 5km. In other words, the most important journeys to shift away from car use to cycle use are not necessarily the longer main road journeys. They’re popping to the shops, they’re dropping the kids at school (the school run accounts for 20 percent of peak traffic). 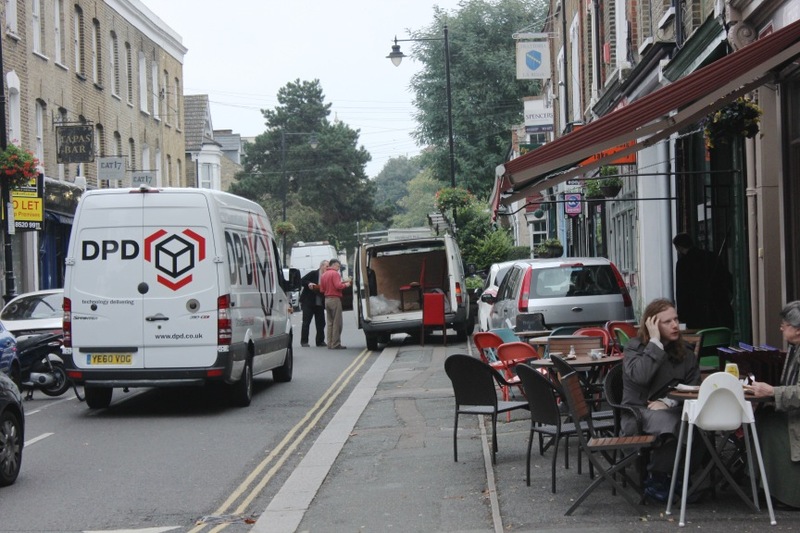 Many local residential streets see thousands of cars a day down them – not stopping, not using the corner shop – just cutting through. This level of traffic, often at lower speeds, may not cause huge numbers of injuries or collisions. But it does create a barrier to cycling. The Dutch close or massively calm residential streets – so people can get on their bike from their front door, knowing they won’t face aggressive traffic. And when they do get to a main road, there’s a segregated track for them. This approach also means neighbours are more likely to talk to each other, kids can play out in the street more often etc. That’s why cutting through traffic in residential areas is vital. On top of that, facing a couple of minutes more in the car for short journeys – hardly a terrible hardship – combined with the increased calm and ease of using a bike or walking will cut cars on the road. We should see more people using bikes or walking for school runs, local shops and trips to tube, train and bus stations – precisely because cycling or walking is calmer, easier and quicker. The combination of road closure cells and main road tracks, just like in many cities in Holland, mean quiet streets from the front door for many residents, and maximum route choice to get where you want to go. It works in Holland – that’s why we want it here. All of the evidence from Scandinavian, US and other cities that are embracing bike infrastructure is that while rain or hills or distance will cut cycling numbers somewhat compared to places which are compact, flat and sunny, the difference isn’t as big as you might think. Hackney, despite being only a bit further in, has a far higher cycling “modal share” than we do. As do many Swedish cities. Hills, weather, distance are not the fundamental barriers to cycling. Poor cycling infrastructure is. Have a look at this blog post on common myths. Longer term, we expect more and more people of “all ages, all abilities” to find cycling is a good fit for their life. Cargo bikes and trailers can get your stuff to the tip or from the shops, and pensioners routinely are seen on bikes all over Holland – keeping them more mobile and healthy later into life. For now, though, we recognise many people won’t just magically jump onto their bikes. That’s OK. The mini-Holland schemes are designed not to increase congestion, or dramatically negatively affect most drivers. And if we can successfully move a whole load of current car trips other people make onto bikes that still means cleaner air and less congestion for you and anyone else who has to use a car. We are also asking the the council to support schemes which help those who face barriers to taking part in any physical activity, or cycling, such as Wheels for Wellbeing. And to ensure schemes are designed with not just tricycles and cargo bikes in mind, but also mobility scooters etc. This means protected tracks and gaps between bollards etc. need to be 1.5m width while crossing points etc. need to be gently sloped. The initial public meeting and consultation over the village trial road closure scheme hardly covered the council in glory. And it’s true, the council can be very deaf, or tone deaf, at times. Despite that, however, the council has mounted one of the largest public consultation exercises it has ever done over the mini-Holland schemes. It’s using an innovative online portal to engage more people in areas affected than ever. And the results are that schemes have demonstrably changed to mirror the general sweep, and sometimes ideas and detail, of resident feedback. c) of course, listening doesn’t always mean agreeing to what you ask – please be aware we at the WFCC don’t get much of what we want from the council! Mini-Holland specifically is also about boosting walking numbers also. And the WFCC is massively positive about not only positive benefits for cyclists, but pedestrians too. In practice that means the following: better pavement surfaces and often wider pavements in mini-Holland areas; better crossings and more of them on main roads; not implementing schemes that cause cycle-pedestrian conflict. Mini-Holland is seeing new and innovative (for the UK) designs that are affecting pedestrians. Floating bus stops and bus stops with a track between the stop/pavement and the road where the bus sits; and “blended” or “Copenhagen” crossings of closed side streets – where the pavement and track continues right across the road. We fully understand concerns being raised about these designs for blind pedestrians and children, among other vulnerable groups. And we’re pushing for safe, high-quality designs throughout that favour pedestrians. But council officers are also only using designs well-established to be safe in European contexts already. And we’re pushing to implement those designs in a way that works for British pedestrians, as well as cyclists and drivers. The missing element, we feel, is public transport. But the schemes were never supposed to solve every problem. Mini-Holland schemes include huge amounts of new cycle parking, including secure parking, near all our tube and rail stations. We’d like to see more a comprehensive review of public transport needs across the entire borough – with a view to prioritising shifting more car journeys onto bus, tube or train. We’d also like to see even better bike-public transport integration – one possibility would be bike racks on the front of buses, as are found elsewhere in the UK and often in Europe and the US. However, these ideas and issues are for another scheme to solve. The current membership and officers of WFCC are what you’d call “vehicular cyclists”. We all already ride on the road, we all already mix it with traffic. So these schemes are emphatically not about us. Mini-Holland is about doing something hugely beneficial for everyone. More cyclists means less congestion, less pollution, less climate change, healthier, happier people. As cyclists already, we know that. But our roads as currently designed represent a huge barrier to more people cycling. 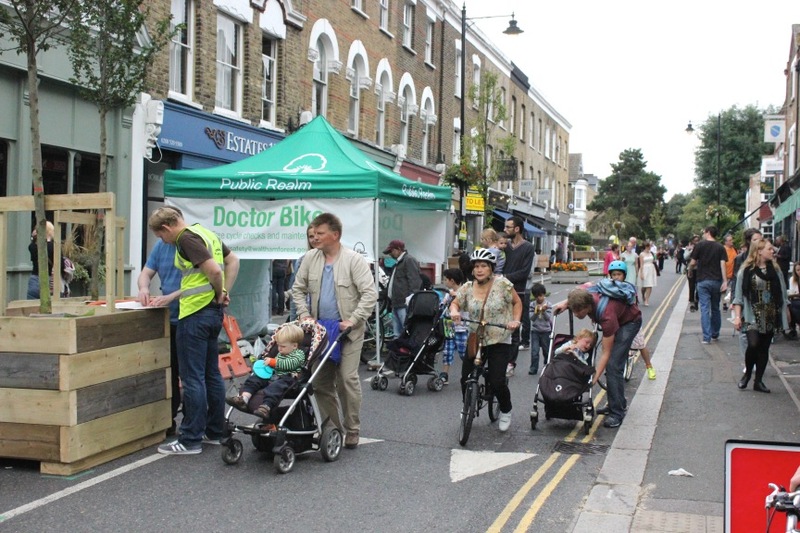 Mini-Holland is about parents riding their kids to school, it’s about commuters able to ride in without covering themselves with helmetcams and high-vis and being constantly vigilant, it’s about people popping to the shops for a loaf and some milk without getting in a car. If you have significant concerns regarding mini-Holland, we’d urge you to talk to the council, or us (miniholland@wfcycling.org.uk). Engaging the process has generally had far better results than fighting it. And we certainly don’t agree with the idea that everything a council does is intrinsically evil – particularly as no one seems to complain about all the other roadworks and Highways changes the council constantly does. If you’re absolutely against or angry with the entire thing, we can only say this: you’re against a scheme that hopefully will reduce pollution? Pollution that kills more people early than obesity and alcohol combined? And disproportionately affects our children’s health? You’re against a scheme that will help make residents healthier and happier? You’re against a scheme that will reduce climate-changing emissions in your area? You’re unwilling to trade a few extra minutes (if that) in a car for all that? We don’t think it says anything about mini-Holland, but it might say something about you. Not for profit community and campaigning organisations are welcome to use any images on this page, ideally with the credit “paul.gasson@gmail.com, Waltham Forest Cycling Campaign”. Thanks to mini-Holland for disrupting the public transport I depend on so heavily. Sorry you have been delayed, and thanks for using public transport which makes more efficient use of road space than other motor traffic. In the first couple of days its likely to have had quite a bit of impact whilst lots of rat running motorists were working out different routes to travel. But we just don’t know to what extend the recent congestion has been due to mini Holland. In the last week or so we’ve had temporary traffic signals at the Hoe St/Church Hill junction which has caused havoc as the phasing is different, a burst water main at the Forest Rd end of Hoe Street, and innumerable other problems (such as 2 large lorries delivering nxt to one another at the same time & blocking Hoe Street near Walthamstow Central). Welcome the initiative but it is in need of serious revision. ” The only people driving onto your street will be those with good reason to be there – so streets will generally be quieter, with the few drivers likely to be more considerate as they’re reaching the end of their journey rather than racing through” Unfortunately this optimistic prediction has not been realised. It has turned the Grove Road end of Eden Road into a rat run; with constant and speeding traffic which in some cases we have had cars coming up the wrong way. It is a danger to young people and animals. There needs to be more access points to prevent pressure points occuring. I’d encourage anyone who has concerns about the trial to feedback directly to officers 2pm – 7pm each day at the Wingfield Road end of the Orford Road closure, or by email to miniholland@walthamforest .gov.uk . Its especially important to do this if you have constructive suggestions on how to make the scheme work better. 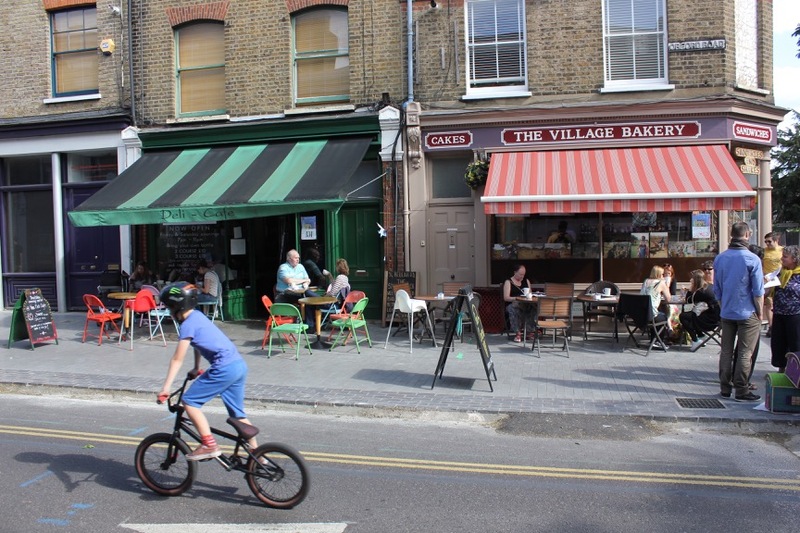 We are massive supporters of mini holland as we live in Walthamstow VIllage and think it is way too busy and hectic. Dangerous and noisy. However, we live on Grosvenor Rise East (where it joins Eden rd – south segment) by the Castle pub and it is an absolute nightmare at the moment and has effectively become a main road as it is the only through route now from Hoe st. to Lea Bridge rd.. We have already emailed the scheme and given written and verbal feedback but just want to make sure everyone is aware of the situation and it’s not left like this or we would have to move house. Currently I am struggling to be in my house due to the noise levels and it is so distressing. Just to be clear, we still really support the scheme but think it needs to go further and all remaining through routes and rat runs need to be sealed. (This could be done easily by closing the end of Eden rd (South segment ) and making it 2 way to enable access. This would solve problems currently being experienced by Wingfield rd. too. J Z, congratulations for sticking with Lea Bridge Road for so long; it’s a mess. If Mini Holland has taken traffic away from the Village and onto Lea Bridge Road, this is a good thing as Lea Bridge Road is a trunk road and will always carry through traffic. Studies from elsewhere indicate that modal filters such as now trialled as Mini Holland don’t just move the traffic elsewhere – car traffic actually lessens overall. It’s called traffic evaporation (see here for example: http://www.onestreet.org/resources-for-increasing-bicycling/115-traffic-evaporation ). So chances are that this increase which you are experiencing is temporary. More importantly, you may be aware that Lea Bridge Road will become a “superhighway” and as such cyclists will be separated from drivers along its entire length. The work is likely to start next year and with delivery pencilled in for 2017. Traffic engineering has historically been very car-centric and this is changing slowly. I can tell you however that Waltham Forest does have access to some very forward-thinking planners and engineers and in all likelihood projects will start shaping up. At any rate, we are looking at plans and will keep the Council accountable. Thank you mini Holland some communication would have been nice!! Not been able to get to my doctors for my appointment & thete was no way of driving round the village at all to pick up my grams prescription. Why did not not forewarn local residents so they could plan ahead? Hi Rebecca, indeed the Council were pretty lousy at communication prior to the trial. We – and others – have spoken to them about it and no doubt you have noticed that suddenly their communication is much better, and – we’re told – will remain so in the time following the trial. Hopefully Mini Holland will make it easier for you to leave your car at home and walk, cycle, or bus it if you have business in or around the Village – or elsewhere for that matter. It has taken a little while for the disruption to settle down as expected. The car and white van ‘rat run’ traffic that starts from 6.30am each day has melted away. The impact for my family is already huge, we live on Grosvenor Rise East/Eden Road junction and it is now so quiet and safe for children and is so much more enviting to cycle upon and will become increasingly so. My immediate neighbours are very happy, we are quite stunned by the scale/impact of the improvement: ‘Its so quiet’. To remove rat run traffic from an area of domestic streets and prioritise cyclistis very rare in London and I applaud the local authority for its endeavours. Great scheme but throughout the trial period it simply increased the amount of traffic on Hoe Street and Forest Road. We’re already finding it very difficult to breathe down here thanks very much! Also, why does TFL think it’s still acceptable to run their old polluting diesel belching bus stock through WF? Hackney and Islington don’t appear to have this same issue. Are we simply not well off enough to have clean air? Hopefully someone sensible will throw this into the mix. Our children and elders are suffering as a result…..
“throughout the trial period it simply increased the amount of traffic on Hoe Street and Forest Road”. Did it? We know traffic was horrendous on Hoe Street for much of the trial and on Forest Road some of the time. But the trial also coincided with rephasing of lights and malfunctioning lights at the Hoe Street Church Hill and Selbourne Road junctions respectively. Since the East/West Avenue closures have gone in, meanwhile, traffic on Church Hill is no better or worse than during, or after the trial. And, obviously, Hoe Street and Forest Road are still routinely horrendous. Again and again, road closures have been demonstrated not to cause predicted, even widely perceived, traffic chaos. Most drivers change their journey – often dramatically avoiding the entire area. Some switch transport mode. About as many decide to sit in the jams that previously did. It all, in other words, settles to approximately the congested roads we had before. Does no one want to leave the village by car? Roads are to drive on, this is not the country, if you want your kids to be safe move out the village or country! Bloody waste of money and one day a cyclist will zoom down a road and knock a kid over, accident waiting to happen…. Sounds like there will be less parking space which, in turn, will encourage more residents to pave over front gardens to use for off-street parking. Which will reduce green spaces! If parking spaces need to be removed as part of Mini Holland works the council does its best to relocate them close by. Where there is a net loss of parking its possible this will result in a few more gardens being paved over for car parking (but note it costs £500 to gain council permission to do this). However overall, the local and environmental benefits of the programme will vastly outweigh any small downsides such as this. I understand there are regulations in place that paved front gardens must be porous. However, a neighbour has paved his front garden according to regulations but has left no borders. The result is that my front garden now forms part of the neighbour’s soak-away. He has paved up to the boundary on both sides, whereas prior to which there were flower beds which formed part of the boundary on both sides. The front garden in question is 7+meters wide so it wasnt done that way due to shortage of space. Even small/narrow herbaceous borders encourage wildlife. Its only just a minority of us on roads who are able to cycle or find cycling convenient to fit into our daily routines. Just like how its only a minority of us in this country who are the super rich and are benefited by this tory based government, and can afford the actual expenses of additional costs e.g. afford losing money when arriving late to a job due to extended journey time (note that the dependecy of public transport will increase and result to a decrease in safety levels). Point being is that the majority of people in this borough are working class and fight enough to pay for daily expenses, so purchasing bicycles/equipment and finding time, which we don’t have, to even get used to cycling is difficult for many individuals. And no, its the inconsiderate who are ignoring the business owners, the disabled, the elderly, pregnant women, babies, anyone who cannot cycle, and all individuals who are basically working class. How can people afford ‘luxury’ vehicles, tax, petrol etc. but not be able to get a bike? The reality is working class people in London often don’t have cars. The motorists pointing at the cyclists calling them ‘middle class’ might want to look in the mirror. The more non-essential journeys we shift out of cars, the easier it will be for those who need to make essential journeys. Although, that said, loads of Dutch tradespeople seem to manage just fine ditching the car too. Well, I actually had this experience and it wasn’t a problem at all, there are plenty of places to park. You seem to be imagining that unloading 3 sheets of plasterboard and some tools will take about 4 hours, but in reality it takes about 5 mins then the delivery lorry goes to the next site – they don’t have time to hang around all day! Similarly with taking away waste – you bag it up in the front garden and putting it in the van takes 20 mins. If you’ve got major works going on you’ll need a skip license but that’s always been the case hasn’t it? On local businesses – The fact is the vehicles which are parked up going nowhere aren’t doing any trade and deliveries have been getting through fine – just look at the supermarket on Orford Road. I arrived home @ 4am on 6.7.2016 to find there was nowhere to park neither near or on the surrounding streets. I pay for a parking permit to park, as the borough has forced myself and other members of the local area to pay for parking bays. Over the last two years the borough have given up our parking bays to parking club bays which that are raising revenue from. at the suffering of the local people who not only pay for bays and council tax we now have double yellow lines which have been added to the area which means when any local resident parks there vehicle in order to move it into a bay when one is available early in the morning will incur a fine as for some reason the bays have been reduced to single bays and the two short term bays have also been reduced to single bays and the single yellow lines have been made into double yellow lines so were am I supposed to park were I parked that morning was the only space to park anywhere near my address without parking in another residents zone also the other two bays which were there have been pedestrianised and four bays have been removed are you forcing local people to move out or are we victims of revenue raising as we have no choice. Yours a very hard working resident being forced into unfair circumstances vire the restructuring of local area were the pedestrianizing and cycling /club car parking are given priority more so than the residents who have propped up the borough for years but never seemed to be listened to. I feel like a prisoner in my own house and a victim of council bulling. Can we have our parking spaces back and can we be properly consulted re the so called development of our local area. 1. This issue appears to have little to do with mini-Holland – the mini-Holland schemes aren’t related to car clubs and largely haven’t changed parking arrangements on residential streets. 2. No one is “forcing local people” out. The majority of local households do not have access to a car as it stands. So how would any of these schemes force most of us out? Force the poorest households out? What I think you mean is these schemes are making things slightly less comfortable and convenient for people who drive a lot. And a lot more comfortable and convenient for people who choose to cycle and/or walk. In the same vein, no one is making you a “prisoner” in your home – all of the mini-Holland schemes allow you to drive to your front door – as you were able to before. You just may have to spend a minute or two driving a slightly longer way round. 3. Controlled Parking Zones are there to ensure you can get spaces on your street – and most CPZ streets don’t have massive parking issues, so I’m curious as to why yours does? Perhaps people are parking in the evening and moving before the CPZ cuts in? If so, then that needs to be looked at with potentially an extension of hours. 4. Councils, given austerity, are hugely cash-strapped. Yet the external costs of us all driving too much is far higher than the costs us drivers pay. In other words, the cost of running a car would be higher, if we were to factor in the cost to society for inactivity, pollution, climate change etc. The cost of parking permits is tiny in comparison to the cost of running a car also. In other words, if you can afford to run a car, the cost of a parking permit isn’t big. 5. The council and London’s politicians have little choice but to rapidly start to try and enable people to ditch their cars. After all, what’s the alternative as 1.5 million extra people arrive in our capital in the next 15 years? With pollution, inactivity and other major issues affecting us all because of too much car use? 6. There is no evidence that the mini-Holland schemes are causing more pollution. There is evidence they are removing a lot of traffic from our area. There is also evidence that in general, traffic reduction schemes such as these and getting people active is far more beneficial for us all than not doing such schemes, even including some extra congestion. Hopefully you’ll start to feel the benefits of quieter residential streets and safer main roads too. That’s the aim of the mini-Holland schemes.